FONA is moving beyond traditional aid models. We believe that development solutions of the past, whatever form they have taken, should be evolved along new lines of thinking. FONA is connecting the world’s best minds—from think tanks and research institutes, to the educational and corporate sectors—to drive this change and ensure that we adopt best practice, including any new technologies, across the board. We define ourselves by this practice of dynamism and collaboration, and through it seek to realise what we are about—understanding aspirations, providing people the opportunity to thrive, and to achieve their full potential. The way we approach solutions is fundamentally collaborative & consultative and our grounding organisational concern is not scarcity—of funding, resources or benefactors—but opportunity. We don’t think that being guided by constraint is empowering, nor is it consistent with our practice of empowering communities in Nepal. Instead, we see, and are guided by, the abundance of opportunity—in the form of ideas, partners and investments—for individuals and groups across our communities. And when we connect with passionate investors and communities, we see solutions in terms of these opportunities, for all involved. This more commercial and benefit-minded approach, reflects not only our backgrounds in international business, but also the idea of Ash Buchanan’s “Benefit Mindset”, which argues that the first duty of any organisation—corporate or NFP—is to look at the opportunity and potential of the people and communities it is a part of, and play to their strengths. In this way, our model shifts away from typical charity exchanges based on closed-silos of individual gain, and rather is driven by the finding that there is real value, for the individual as well as society, in collective benefit—to the community, to nature and to the future. Thus, FONA’s whole systems approach involves both the consultation with local communities and the collaboration with global partners in order to find a solution that promotes long term well being and collective benefit to all involved. Partnering is the way FONA operates as an organisation. We don’t see other organisations and communities as rivals or competition, or even just as stakeholders, but as potential collaborators. Collaborating not only to deliver projects and programs, but also to approach solutions, and identify shared goals. Finding a win-win with all partners, be they corporate, think tanks, state actors, communities or individuals, is critical to the way we function. A case in point is the world class Education Centre of Excellence project in Purano Jhangajoli. The design for the learning and technology hub and community centre came as a result of community consultation and a FONA hosted “think tank” in collaboration with the University of Melbourne, IncluDesign, Thrive Research Hub, Cohere and Biourbem. Throughout the planning process representatives from the village were present, as were experts including designers, architects, engineers, heads of social enterprise, sustainability and regenerative design, educators, academics and positive psychologists. What’s more, FONA and the University of Melbourne used this opportunity to conduct research into the benefits of a collaborative development process. Evidence showed that involving people in all stages of the design process creates a sense of stewardship and ownership of the project, and that this collective process of setting a vision for the future, planning for it, and realising that vision, is particularly important for people who have experienced tragedy—in this case, local communities affected by the 2015 earthquake. Bringing experts together and working in this collaborative way also provides the opportunity for personal and professional growth for all involved. 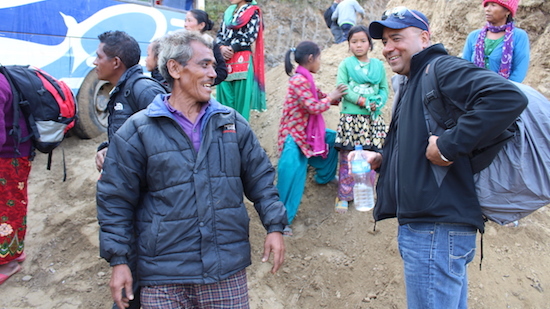 During the project, Janak Raj Pant, a Nepali engineer working in the district of Sindhuli, was introduced to the concept of Regenerative Design by Lead Designer Angelica Rojas Gracia, leading to his own new understanding that it is possible to both develop and protect a community’s heritage and environment. Janak is now an advocate for Regenerative Design—[see our blogpost about Janak and Angelica’s collaboration for more information]—and applies these ideas to his work for the Nepali government. These are just a few of the manifold benefits we see from partnering at all levels of our organisation and throughout all stages of the development process. Finally, and in line with our purpose to provide people the opportunity to thrive, and achieve their full potential, we are interested in inspiring the next generation. We do this by pioneering new forms and levels of community consultation, by adopting new methods of design, and by finding from around the world the best solutions for community development. We work closely with the communities we partner with so that the solution to their needs comes from them, and through this process, they create their own hope. We adopt a Regenerative Design model, to build back community infrastructure better than before. We look at the aspirations and strengths of distinct communities and ask ourselves what leapfrog technologies we can provide to allow them to connect with the world and access other opportunities. Our Education Centre of Excellence, as an example, is going to feature science and computer labs as well as innovative natural and renewable resource management solutions, with solar energy, water harvesting, and a biogas sanitation system. By offering the best, we’ve really made people—communities and organisational partners alike—excited at the prospect of these opportunities. Many organisations now want to be associated with this more holistic and involved relationship of ‘inspiration aspiration’ rather than the simple dispatch of aid. And rather than just donations, we’re finding people are now willing to give us $100, 000 worth of their time and skills, which to me, and others involved in the work we do, is priceless. It means another partner, another advocate; people so involved with the solution that they can them explain the benefits of our approach to others. We are passionate about fostering one-to-one relationships between Nepali’s and their overseas peers. We’ve begun facilitating these connections between individuals through a range of programs. Our internships link young people and professionals to Nepal through the communities we partner with, championing a spirit of curiosity, openness and respect. This fosters both cultural and professional learning, and is designed to facilitate future partnerships and exchanges between interns and those they connect with. We will also extend a professional mentorship and networking program to Nepalis in Australia, enabling the Nepali diaspora to connect with one another to realise their potential through the power of network. Ultimately the Nepali people and their aspirations are the reason for our existence at FONA. And the fortunate, personal connection I have with the country helps me to share in some way a vision for its future. I grew up in Sindhuli province, was educated in Nepal, and understand from my own lived-experience some of the challenges its people are facing. And just as importantly, I am cognisant of the spiritual, cultural and economic strengths of Nepal, which are what we need to focus on moving forward. First and foremost this personal connection will be about understanding—about listening and communicating always, before anything else. 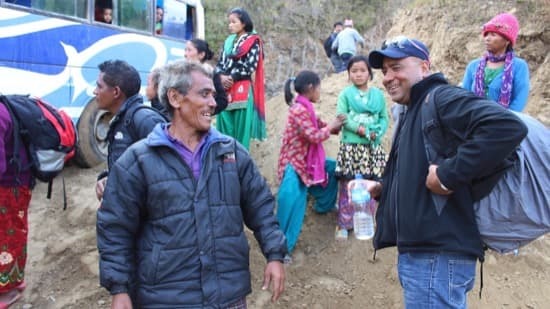 And in this way FONA, its partners and the communities won’t forget why we exist—to work together, through consultation and innovation, to empower Nepal. Share this article and tell us what you think of FONA’s new model for development.